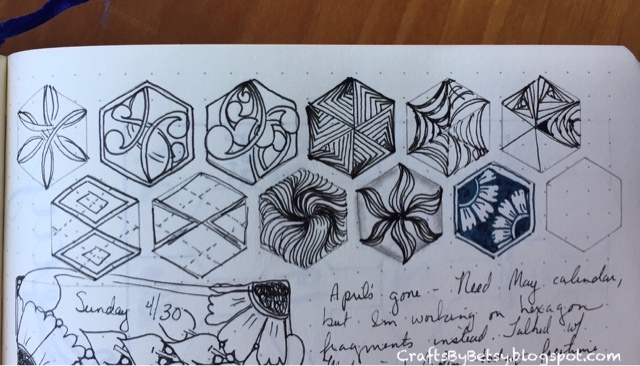 I love it when my Zentangle® and card making worlds collide. Hexagons had been catching my eye and I purchased some hexagon dies. 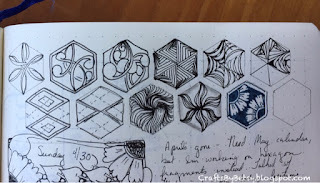 As soon as I tried the first cover plate from Papertrey Ink (it is cut to exactly cover an A2 card, so 4 1/4" x 5 1/2") I knew I had to try it out as Reticula and Fragments! Although the die exactly fits an A2 card, I trimmed this one down so I could have a red frame around the edge. Here I'm just testing out some fragments in my bullet journal. 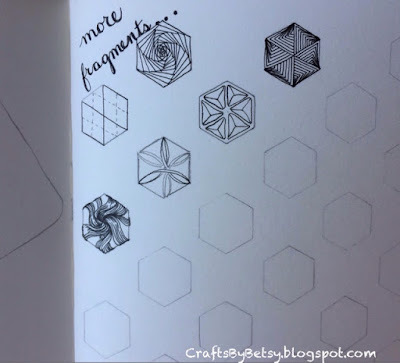 And below I decided my prestrung Zentangle art journal needed a page of hexagons too! This journal is nice in that there are both prestrung pages and blanks, and of course the paper is oh, so nice. I'm really glad that Deana kept showing me her journal, convincing me I needed one too! And back to my BuJo (short for bullet journal, but sounds nicer don't you think?) 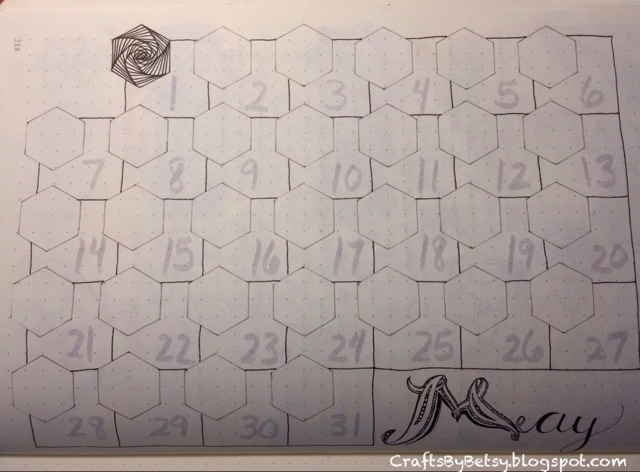 for May's calendar. So I said I purchased dies plural, right? Barely got around to my next set of nestabilities by Spellbinders. 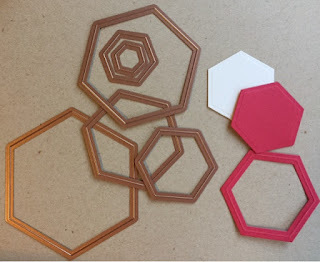 They cut all these nesting sizes of hexagons. You can cut 2 together to get a frame too, AND they emboss nicely ( see that embossed edge?). These will cut nice tiles! Here I used one for a cut out of a card for someone special ....and didn't even include any tangling! 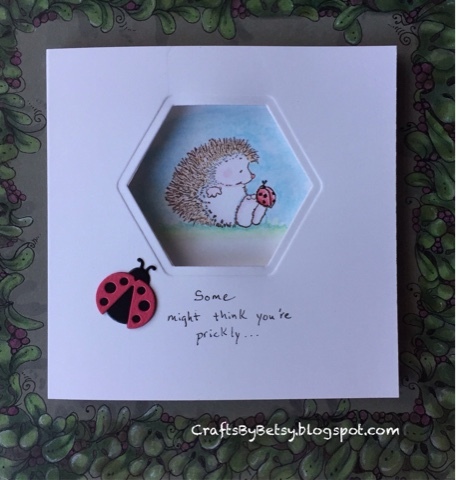 The stamp is by Penny Black from the transparent set "Bubbly". And the larger of the two ladybugs, is the cutest little die from Elizabeth Craft. It's one of my favorites. You can also see it here in one of my earliest posts.. Enjoy the day! Thanks for your kind comments, they make my day! Wow ! 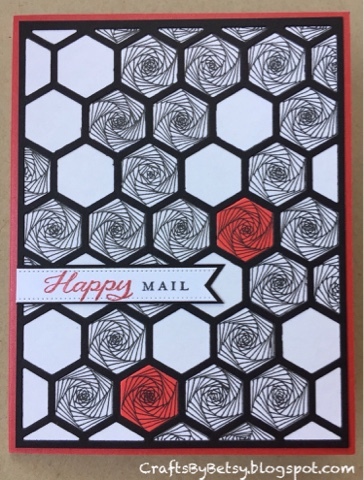 I love the hexagon card with paradox. 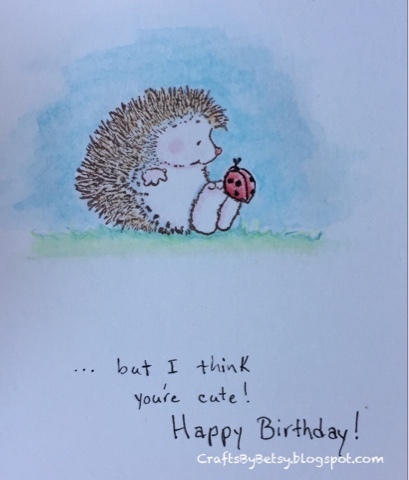 And the hedgehog is adorable.